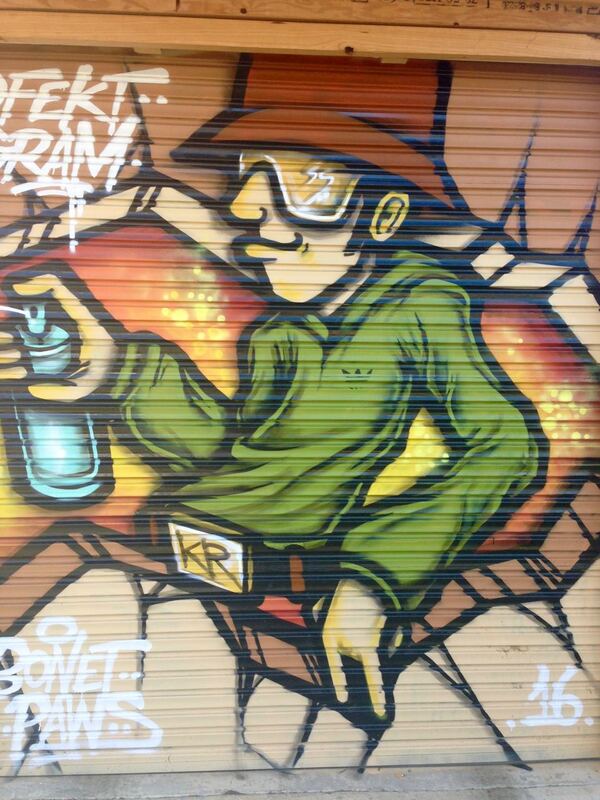 While life is busy, here is some street art from Coburg to entertain you. Above is a current favourite of mine with the Cat in the Hat and Adventure Time. 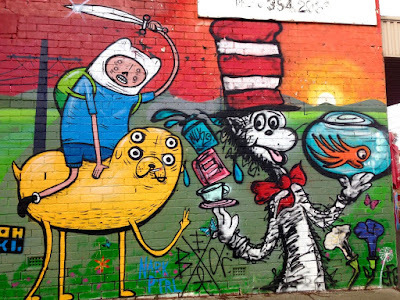 It is off Harding St and last time I passed was messed up a little by some graffiti. 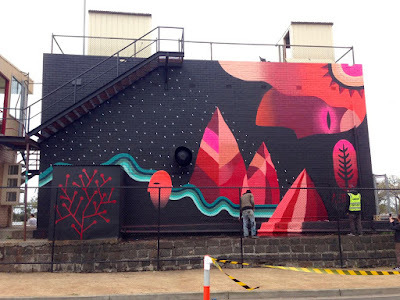 A few of these photos are from last year's MoreArt 2015 (Moreland Council's public art show). 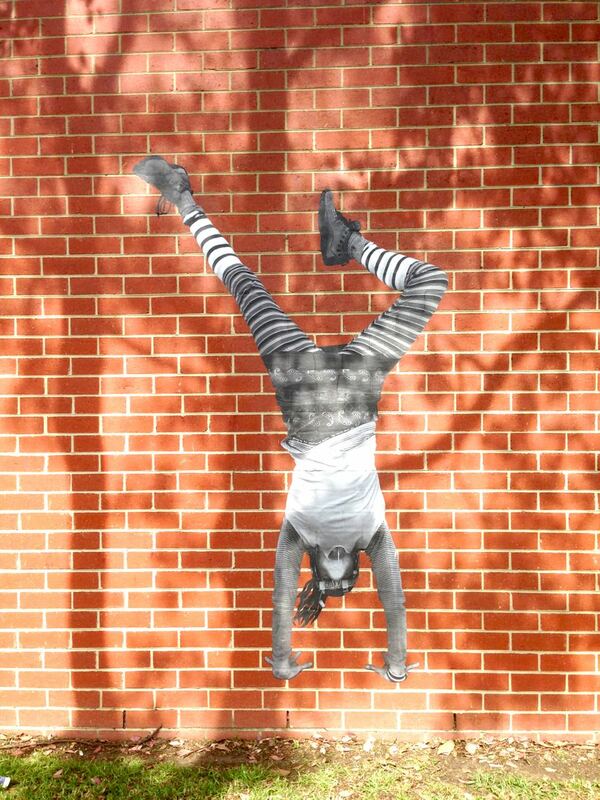 I really loved the handstand pictures by the Coburg Leisure Centre and in the Victoria St Mall. Sadly no longer there. The handstand pictures are by Larissa McFarlane. 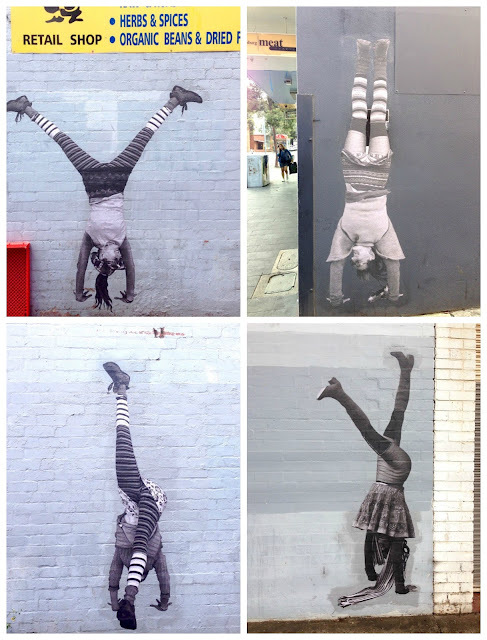 They chronicle her self management of chronic illness by doing daily handstands. 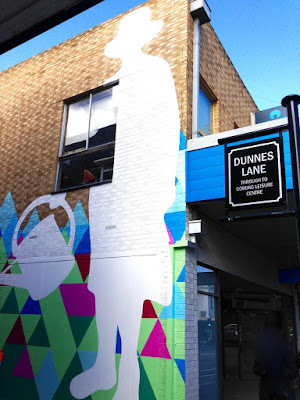 Also part of MoreArt was this picture in Dunnes Lane. Again this is no longer there. Dunne's Lane now has a new artwork and seating. You have to crane your neck to look at this silhouette. 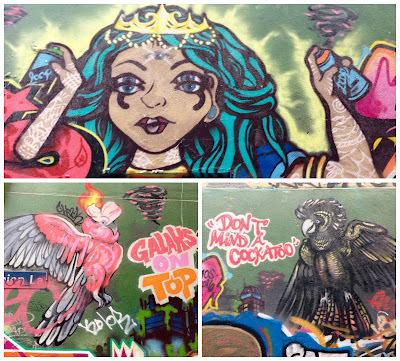 We also have some recent new artwork on the football oval. Can you see the fluorescent yellow vest of one of the guys working on this artwork? 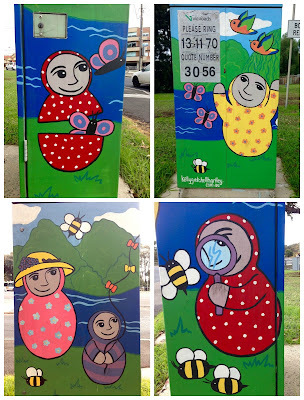 Painting signal boxes is widespread in the inner north of Melbourne. 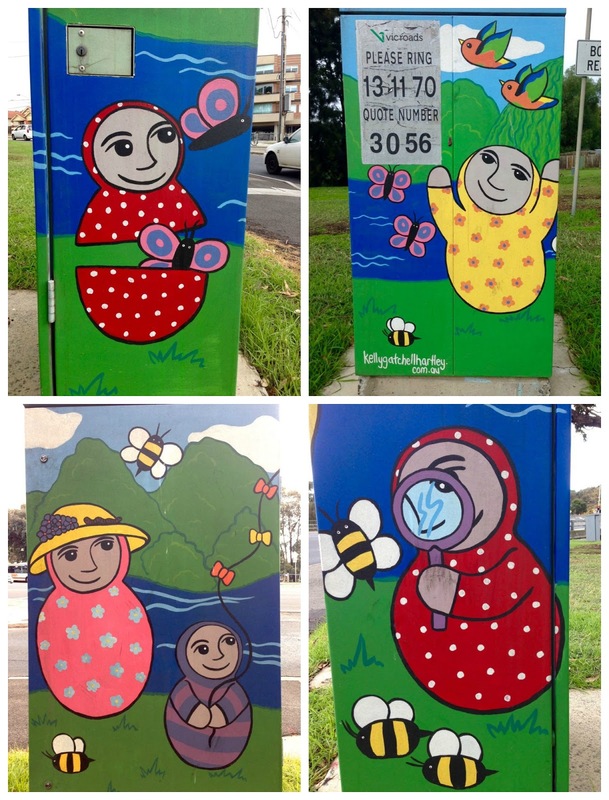 These cute pictures on a signal box are at the corner of Bell Street and Nicholson Street. 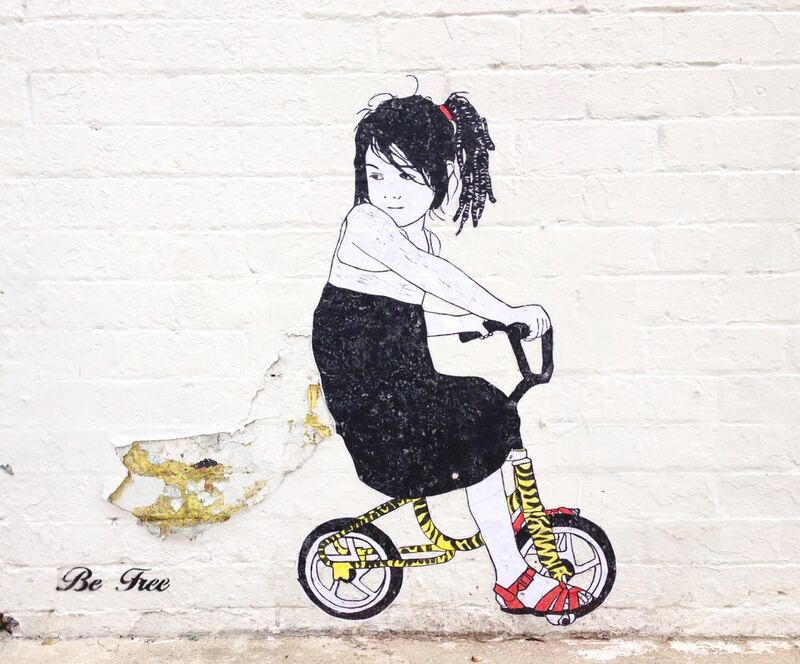 Just a bit further up Nicholson Street on the corner is this Be Free picture. 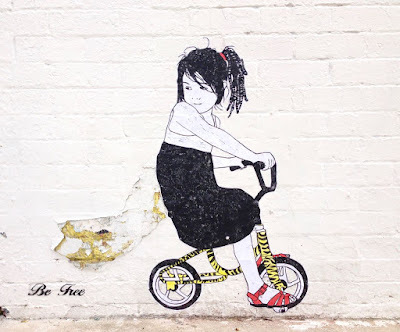 I went to do a body balance class recently and it was sold out so I had a bike ride instead. 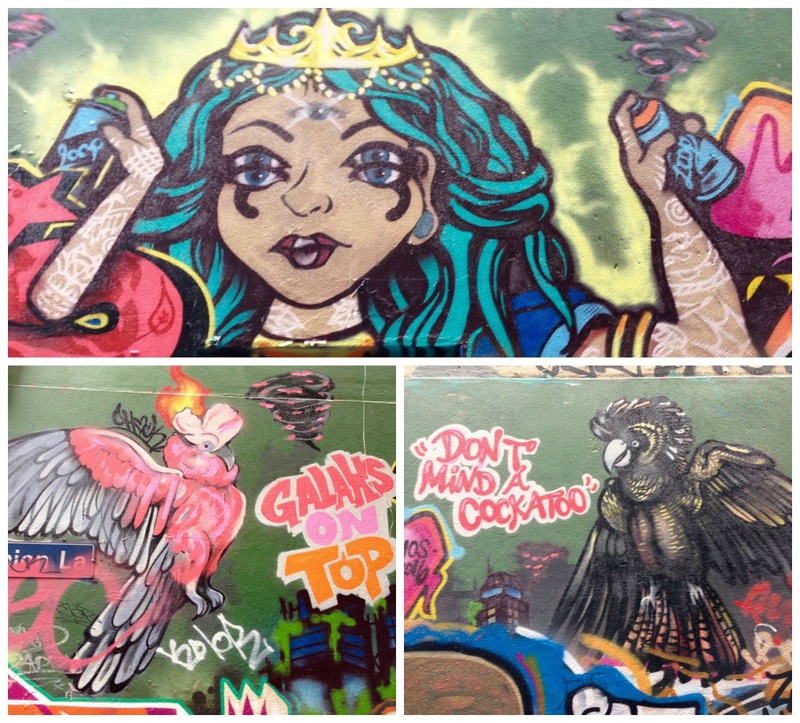 Most of these pictures above are from the Upfield Line. As are the ones below. More Coburg Street Art pictures in 2014 and 2015. The weekend we had a day at home to potter about and try to organise the house. Some messy corners were tamed and regular chores done, I found some time to read my book and Sylvia went to the park with a friend, but best of all was starting the day with fluffy pancakes oozing with a blob of decadent Nutella in the middle. 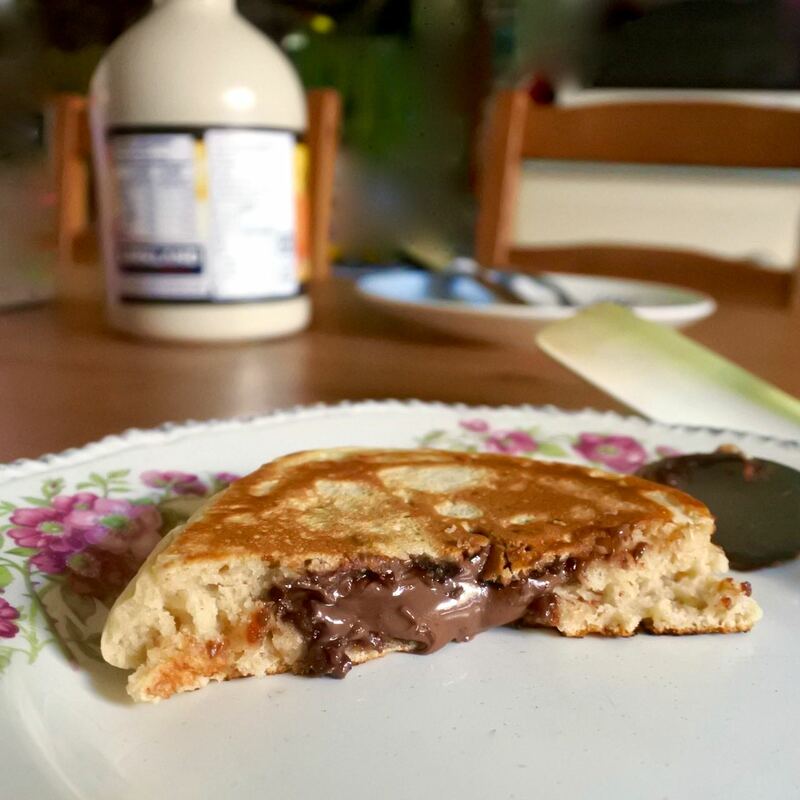 Last winter I first tried making these stuffed nutella pancakes with a favourite banana oat pancake recipe. 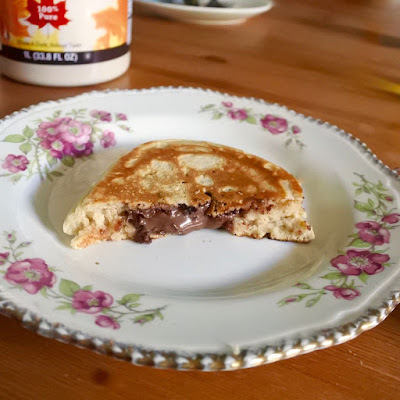 With nutella in the house this weekend, Sylvia requested it for breakfast. I tweaked the pancakes we often make (based on Vegan Brunch) and nutella worked so much better in these. In fact I wasn't going to blog it but I just loved how fluffy these pancakes were that I wanted to make notes of what I did. Of course, as I said last time that I posted about this idea, you could put nutella in the middle of any favourite pancake mixture. I highly recommend trying it in the middle of these fluffy pancakes. As the pancake mixture is vegan, you could easily make it vegan by using a chocolate spread in the middle. 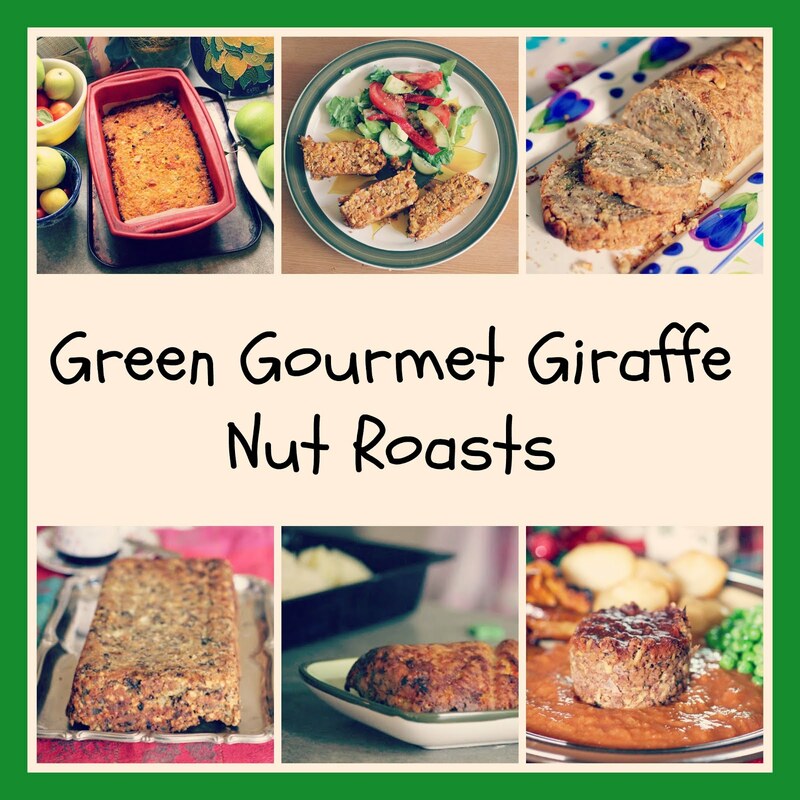 Check out more nutella recipes and ideas at Green Gourmet Giraffe. Drop heaped dessertspoonfuls of mixture on frypan and use the back of the spoon to spread each as much as possible into a circle. 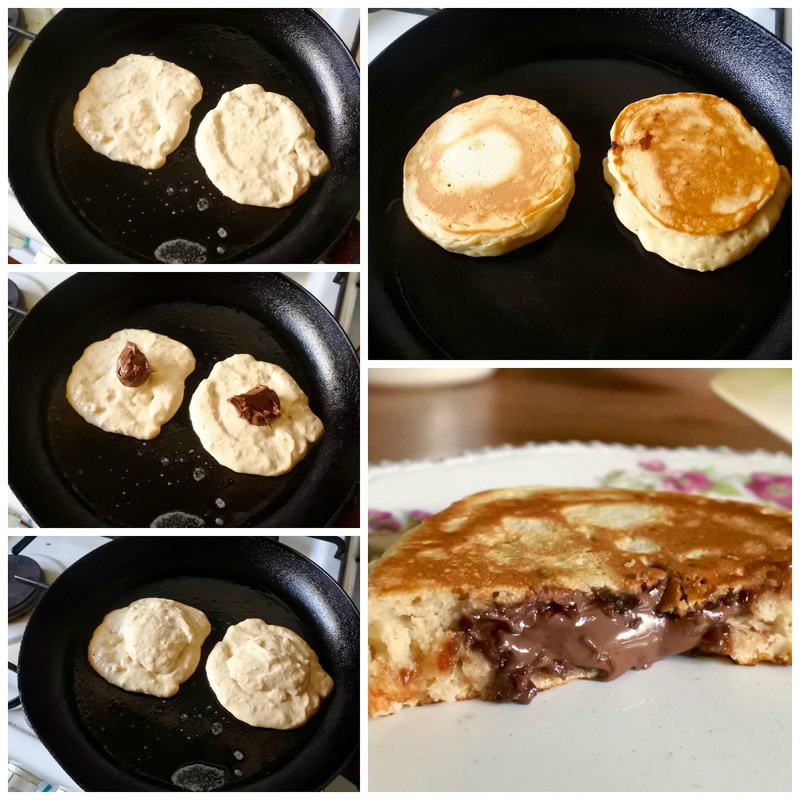 Drop a heaped teaspoon on nutella in the middle of each pancake and cover with as much pancake mixture needed so you can't see any nutella. Fry for a few minutes until pancakes looks cooked (the texture will dry out a little and there might be a few bubbles). 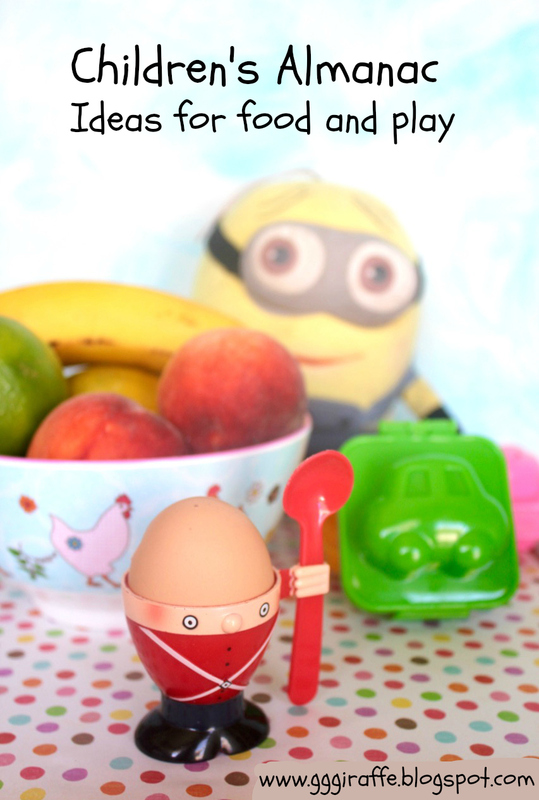 Flip over and use an eggflipper (spatula) to flatten slightly. Cook another minute or two until cooked through and remove to a plate. Best eaten warm. Eggplant (aka aubergine) does not appear often in our kitchen. 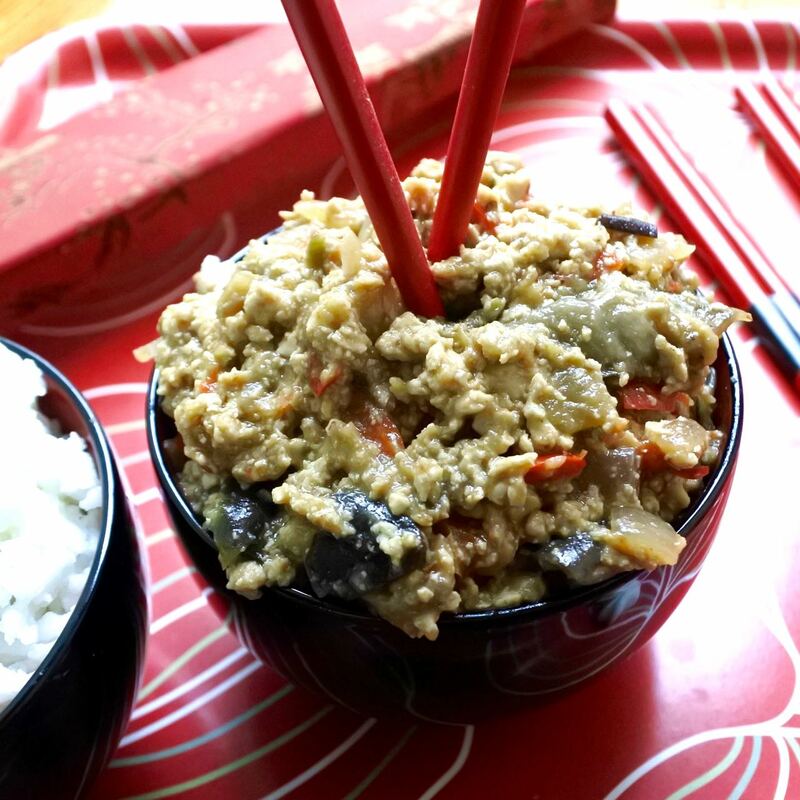 So I was very pleased with myself when I recently made a braised eggplant and tofu dish for dinner. I asked E what he thought. "Passable." So I asked what he didn't like about it. "The fact that it was eggplant and tasted like eggplant". Oh! Well, I told him, that is what I will be serving tomorrow night unless you feel like eating a raw potato! Indeed it is a challenge to make eggplant dishes in our house. Though to be fair, E did eat it the next night and conceded he enjoyed the flavours. (Better than a raw potato!) 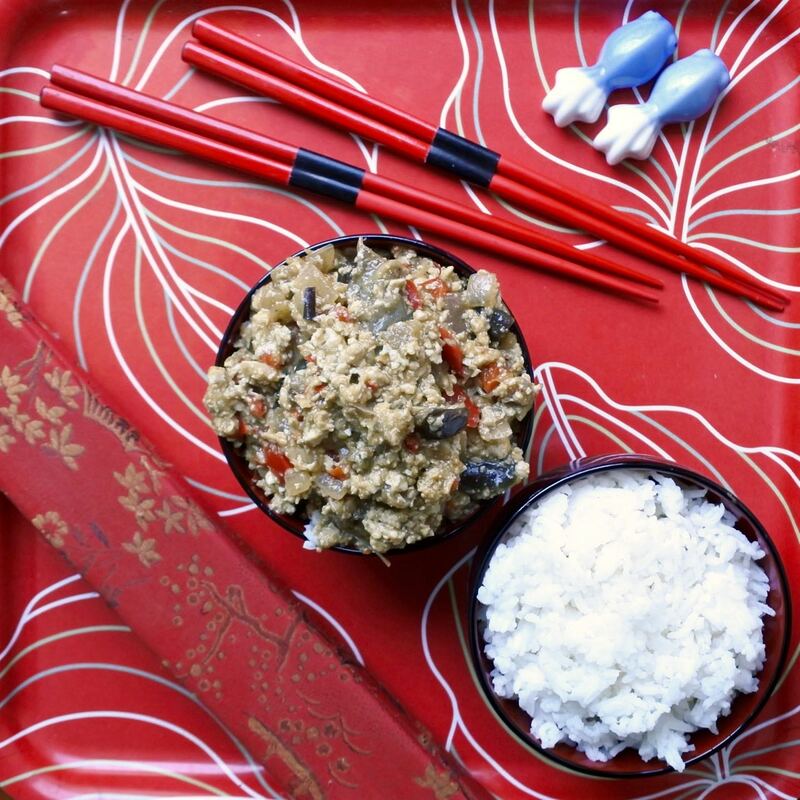 The recipe is based on a family recipe that Lorraine of Not Quite Nigella shared which used eggplant and chicken. I did my best to be really organised before I began and cooked the eggplant until it melted in the mouth. I wanted to make sure there were no accusations from E about it not being cooked enough. The finished dish looked very different from the dark saucy dish that Lorraine shared. 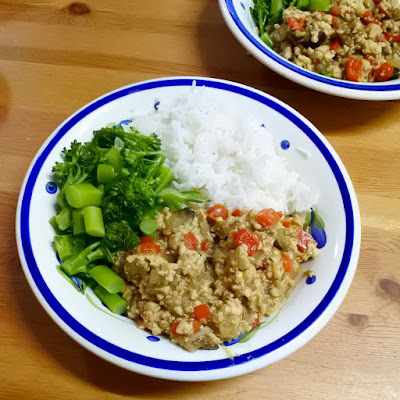 I had not been quite sure how to cook the tofu. So I crumbled firm tofu. However I always have problems with frying tofu tossed in cornflour. It just sticks to the pan. So I decided not to bother much with it. Later I wondered how the dish would be if I had fried cubes of tofu without bothering about the cornflour and then added to the braising. The way I cooked the tofu, it ended up as soft as the eggplant. Not a bad thing. It was a very soft comforting dish with lots of seasoning and a slight heat from the ginger and chilli. I am not sure that E would encourage me to make it again. I would like to try it again with the tofu fried crispy and to try coconut sugar instead of white sugar. It is a really lovely dish that I could see working well in a Chinese buffet. crumble tofu into a bowl and mix with cornflour, salt and sugar. 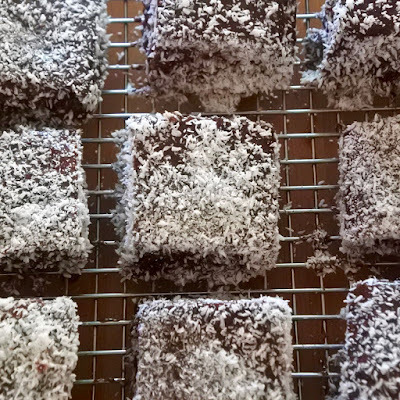 What else is there to do on National Lamington Day but make lamingtons. It was a close call. I usually miss these foodie celebration days. But I had a vision. 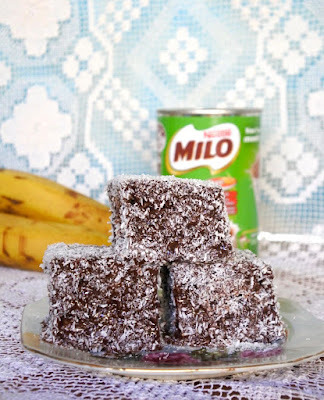 I've been wanting to try a lamington with Milo in the chocolate icing. If you don't live in Australia you might need a translation of this sentence: "I've been wanting to try a piece of cake dipped in chocolate frosting and shredded coconut with chocolate malt powder in the chocolate frosting." 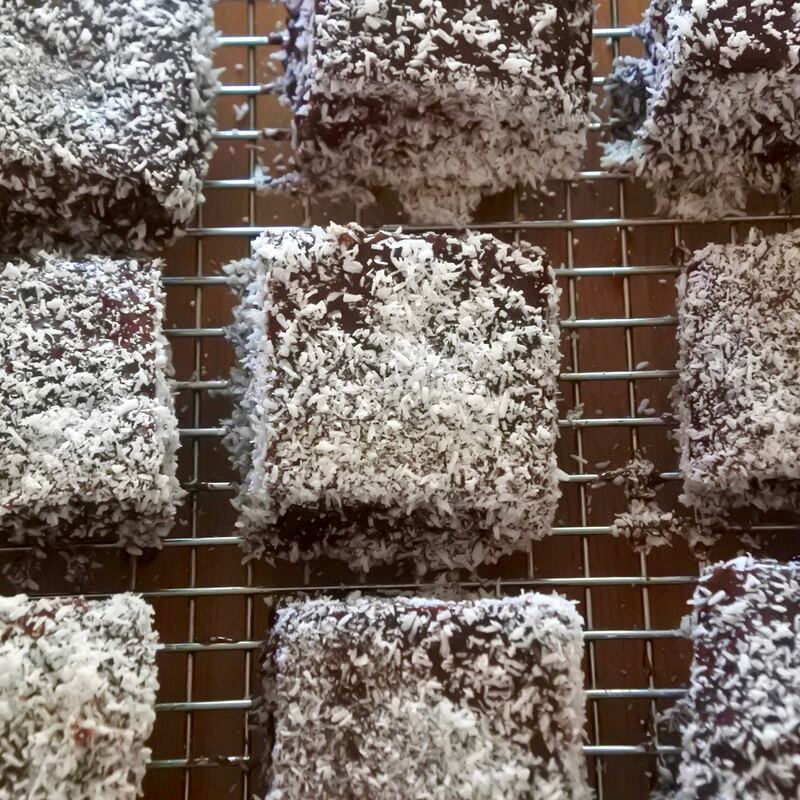 If you haven't tried lamingtons, I highly recommend you do so. They are a sentimental favourite for me but honestly they taste delicious. As it happens I also needed to use some manky bananas and searching the web for ideas turned up the brilliant idea of making banana cake instead of sponge cake to make lamingtons. 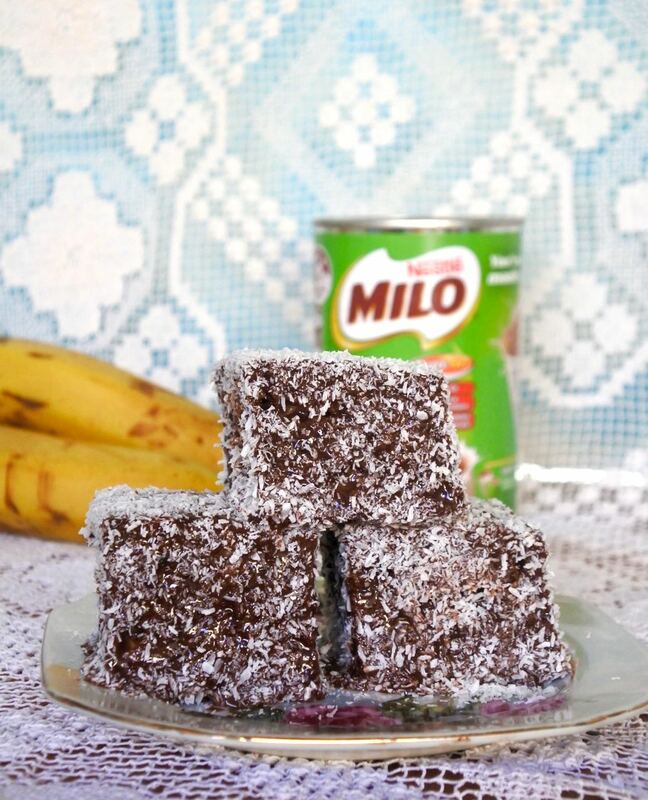 I simplified a recent favourite vegan banana cake, referred to some impressive lamington icing but added heaps of milo. I looked at this Love SWAH milo icing and was impressed and the high proportion of milo but am not sure it would work that way on lamingtons. 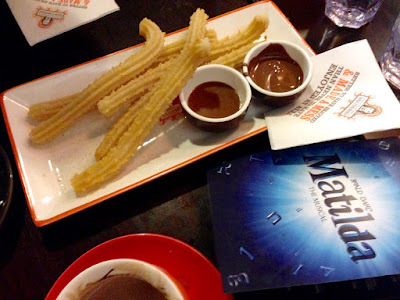 Nevertheless I think the milo gave the icing a nice mellow malty flavour. E tells me that these lamingtons are extremely moreish. I tend to agree. Sylvia demands that she has one in her lunchbox tomorrow and in turn I am demanding that she wash her hands after she eats them because she creates such a sticky mess with them. 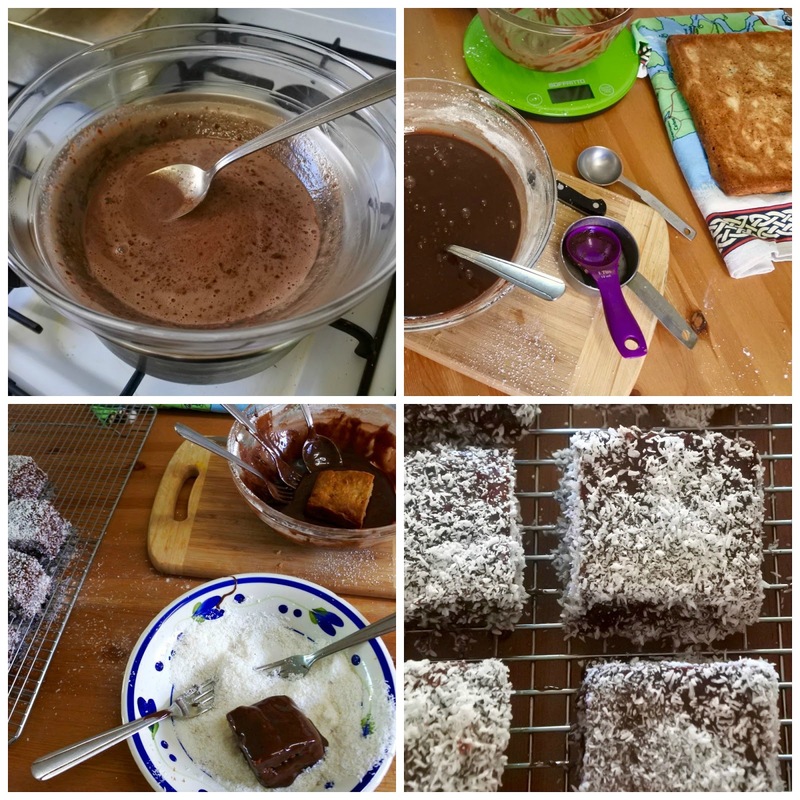 Though I really love them, the great Aussie lamington is so messy to make and eat. Perhaps next time I just do the modern thing and spread the top of the cake with chocolate icing and sprinkle coconut over it. Far easier and cleaner. Yet just not the same as dunking the chunks of cake in icing and coconut! So I am sure there will be more batches of lamingtons in my kitchen. Meanwhile I wish you a happy National Lamington Day. I am sending these lamingtons to Choclette for We Should Cocoa. I am also sending them to Janie (and Karen) for Tea Time Treats. Leave the sponge overnight (or place in fridge for an hour to firm up). When you are ready to coat the lamingtons, make the chocolate icing. 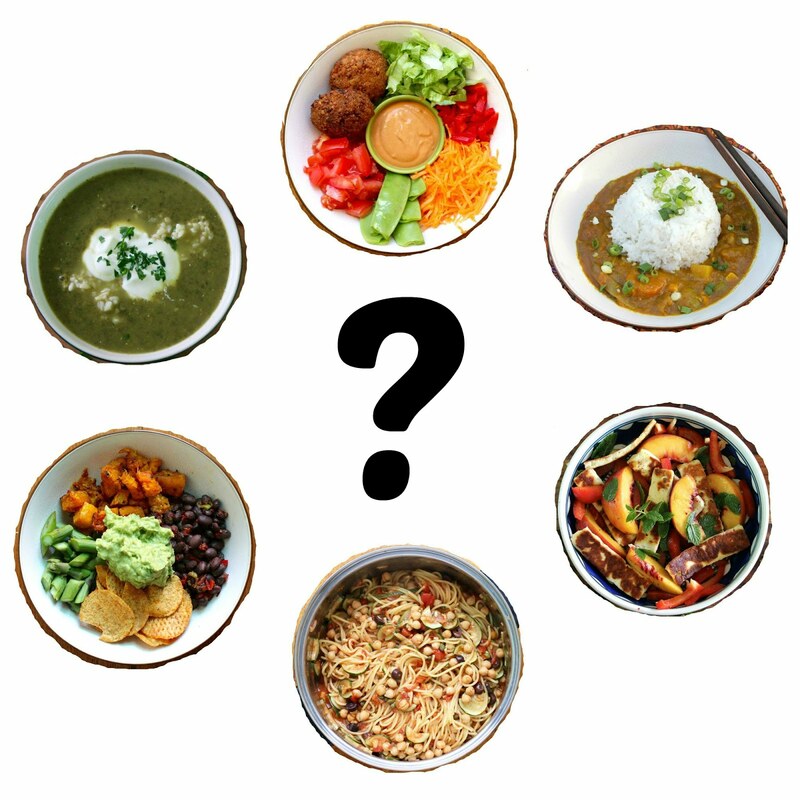 Choose a heatproof bowl that is about medium mixing bowl size but not too deep because you will be dipping into it. Stir the margarine and milk in this bowl over a gently simmering saucepan of water until the butter has melted. Turn off heat and remove bowl from the saucepan. Stir in milo until it dissolves. Sift the icing sugar and cocoa together and mix into the milk mixture until you have an icing that seems thick when stirring but drizzles off the spoon easily. Cut the sponge cake into 20 squares (ie four rows lengthways and widthways). Set up the bowl of chocolate icing with two forks and a spoon, a shallow bowl of the coconut with two forks and a large wire rack. Drop a square of cake into the chocolate icing and cover in icing, spooning icing over it if necessary. Pick up the square with two forks and hold above the bowl to let as much icing as possible drip back into the bowl. Drop the icing covered cake into the bowl of coconut. Use the forks with the coconut to toss the cake in coconut. Pick up the cake with the forks and place gently on the wire rack. As you can see in my list of equipment, I find it easiest to use different forks for the icing and coconut bowls. This recipe will drip a little under the wire rack. NOTE: These are vegan if you don't use the milo. 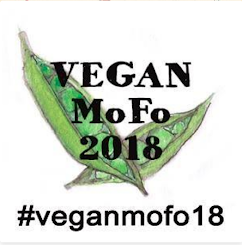 To make these vegan I suggest substituting this chocolate icing (though I think I needed a bit less) and perhaps adding some malt extract syrup instead of soy milk if you would like the malt flavour. After our Christmas in July dinner last weekend we ended up with lots of leftovers to see us through the week. On Monday night I made a soup out of some leftover roast vegies, other vegies that needed using, rice from the freezer and the rest of the cauliflower cheese. It was a beautiful melding of leftovers! Creamy with just a little texture. Even Sylvia ate a small bowl of it. 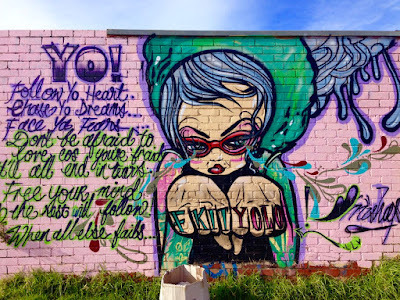 "In a wiser, more self-aware society than our own, a standard question on any early dinner date would quite simply be: "And how are you mad?"" 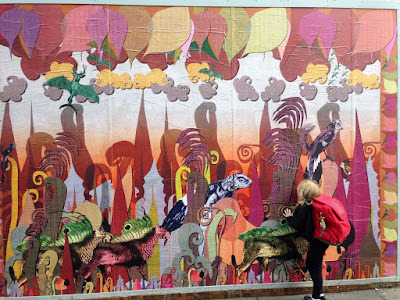 "Algorithms such as the one that powers Facebook’s news feed are designed to give us more of what they think we want – which means that the version of the world we encounter every day in our own personal stream has been invisibly curated to reinforce our pre-existing beliefs." 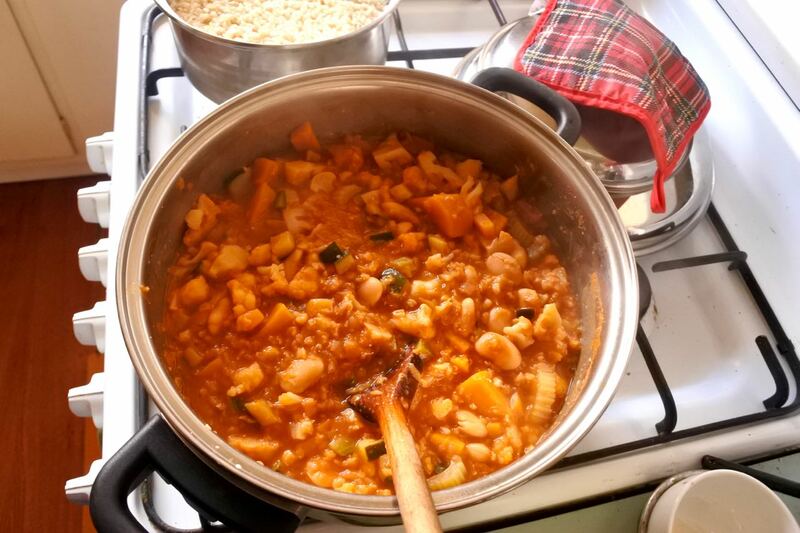 I am sending this soup to Lisa (with Jac) for a favourite vegetarian soup and salad blog event, No Croutons Required. Cook celery in a small amount of water in a large saucepan for a few minutes until it softens. 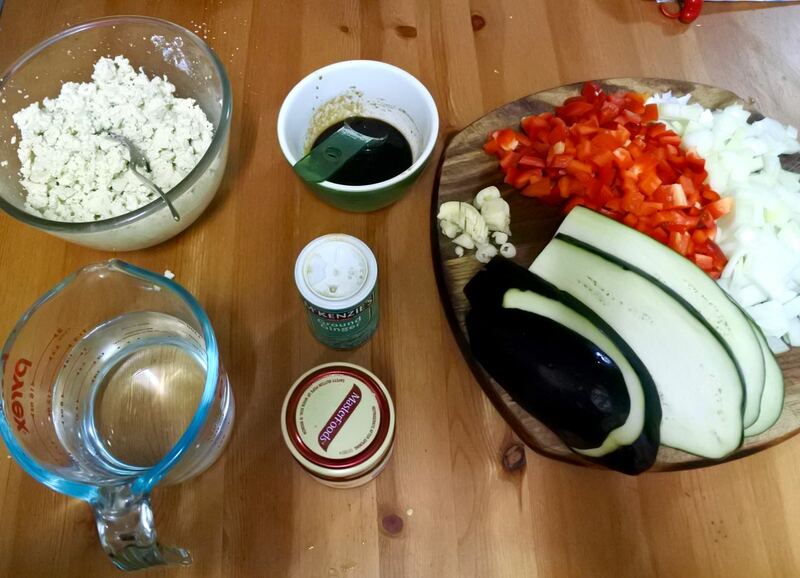 Add red pepper and zucchini and cook in a small amount of water until softened. 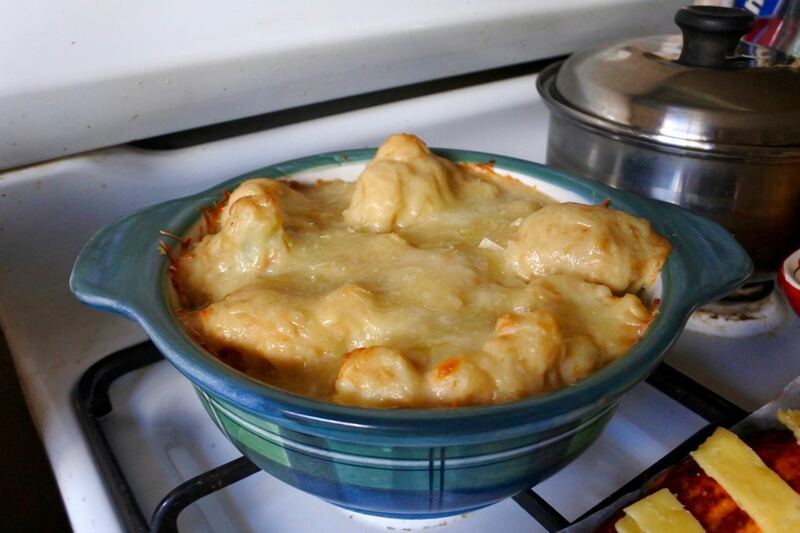 Add cauliflower cheese, pumpkin, garlic, gravy and about 2 cups of water. Cook briefly until warmed - about 5-10 minutes. Puree with blender. Season lightly and add rice and potato. Cook for about 5-10 minutes. Stir in cheese until melted. Check and adjust seasoning. Serve warm. NOTES: The soup seemed quite thin when blended by thickened up when potato and rice were added. 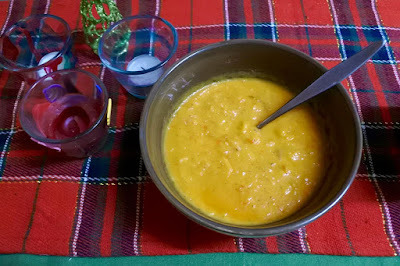 This recipe could be adjusted to use up other leftover roast vegies but lighter colored veg are best if you want the lovely warm orange colour. 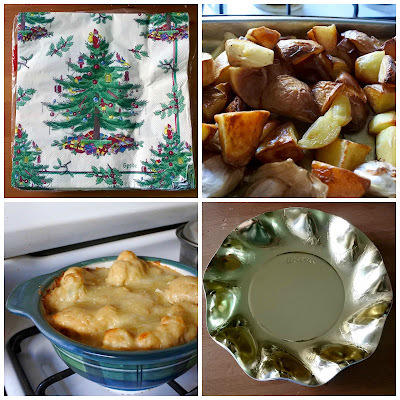 To read about how I make cauliflower cheese, roast vegies, and gravy, check out this winter solstice roast dinner. It is bitterly cold in Melbourne this week. A wild wind, snow on the outskirts and some heavy rain have chilled us to the bone. 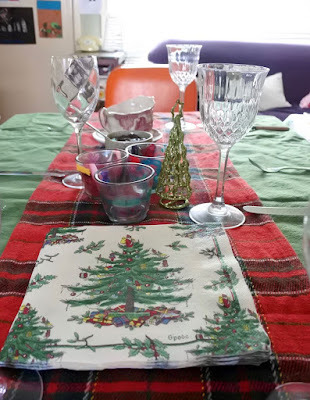 I had hope for some wintery weather on Saturday when we had a Christmas in July lunch at our house but it was a bright and sunny day. Nevertheless we had a lovely festive meal with friends and the dry weather meant the kids could run around outside. The day before the lunch, Sylvia was at a friend's all day and I baked and cooked and cleaned. I continued cooking into the evening. By the end of the day I had been to the supermarket, made reindeer cake pops and chocolate and fruit mince flapjacks, a saucepan of mulled wine was resting, I had the nut roast and cauliflower cheese ready to bake, there was a big jug of gravy in the fridge and a large saucepan of chopped potato and pumpkins sitting in water prior to roasting. The house was still a mess but that would have to wait. The next morning before everyone arrived we got up and started preparations. I put the potatoes, parsnip and pumpkin in the oven to roast and then I made the pizza dough to make candy cane pizzas. We all did lots of cleaning and E did a sterling job with the dishes. 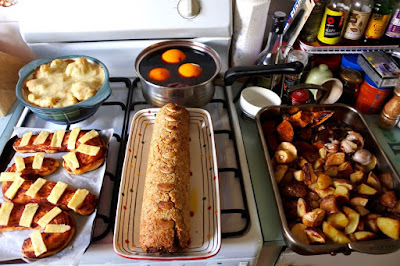 The nut roast and cauliflower cheese went in the oven to cook. Once the house was looking cleaner we bought out some of the good serving dishes. 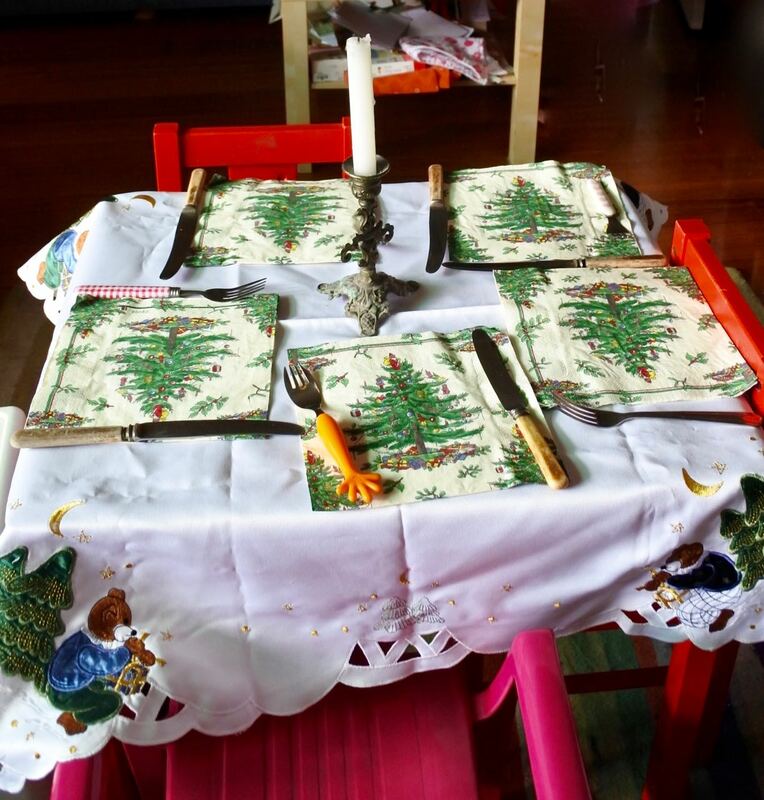 The gorgeous Christmas tree Spode serviettes were found in E's dad's house when it was cleaned out in March. We suspect his mum might have bought them years ago. They made me think of her and her wonderful Christmas meals I shared with E's family. The cauliflower cheese make me think of my family because we often had it with roast dinners as a child, and still do. I then had a moment of calm when it seemed I was really organised. Everything was ready to be warmed up or briefly cooked when our friends arrived. The gravy was in the microwave. The candy cane pizza had been cooked with the tomato sauce on for about 30 minutes and had some extra sauce spread over it and stripes of cheese placed on it. Then there was the fun of setting the table with Christmas candle holders that Sylvia made at kindergarten, the gravy jug and cranberry sauce and sorting out glasses I felt were robust enough to handle the warmed mulled wine and finding smaller glasses for the Baileys. Sylvia had fun setting her smaller table for her friends. We even brought in a little plastic Christmas tree and put on some carols. By the time our guests arrived, we were pretty organised with just the brussels sprouts to prepare. And they don't take long to trim and boil up for 4-5 minutes. Brussels sprouts have a bad reputation and I only started to associated them with Christmas when I lived in the UK where they were in season in the festive months. (My family always had green peas.) But we love them in our household and so perhaps it is not surprising I didn't have any leftover. 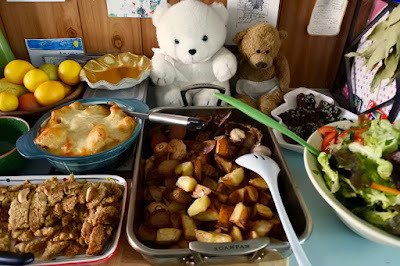 As I have already said, we had heaps of food and it was lovely to share it with friends who had of course brought over generous contributions of salad, wine, rumless rum balls, baileys and ice cream. I had made the candy cane pizzas for the kids to start when they came in. The adults were greeted with mulled wine. By the time we were settling into our dinner the kids had eaten and run outdoors. Main meal: stuffed nut roast; roast potato, pumpkin, parsnip and garlic; cauliflower cheese; brussels sprouts; green salad; gravy; cranberry sauce. Dessert: reindeer cake pops; rumless rum balls; chocolate and fruit mince flapjacks; baileys irish cream and tea or coffee. 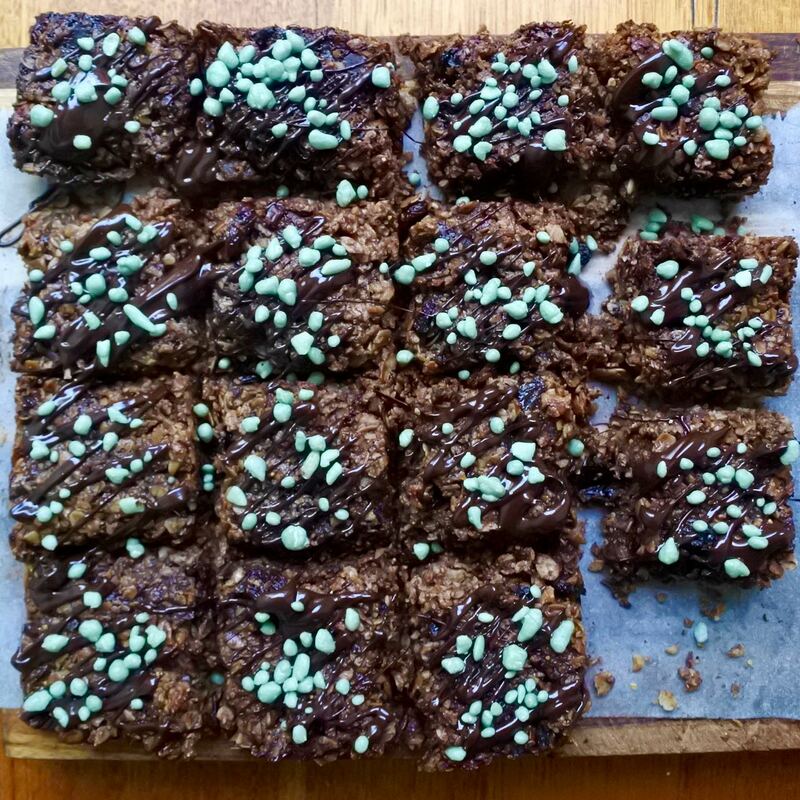 I made a batch of chocolate and fruit mince flapjacks because I still had fruit mince leftover from Christmas and was determined to use it up. The flapjacks seemed an easy way to use it (though I was very tempted by this mincemeat and apple caramel cake). My take on JibberJabber's recipe is below. I did a poor job of drizzling chocolate over them and then scattered some chocolate covered popping candy (again leftovers from Christmas that Sylvia unearthed recently). I often have trouble with flapjacks and end up with muesli when they collapse. These ones held together but looked pretty messy when I cut them. I wondered if they needed slightly longer in the oven (mine is slow) or if I had messed with the ingredients too much. I found them quite soft but they lasted well for at least 5 days (and counting) and have made great snacks. I was surprised at the prominence of the fruit mince flavours and have enjoyed the chocolate topping with the fun surprise of the popping candy. Everyone kindly chipped in to help with the dishes at the end. This meant that when everyone left we could just flop on the sofa and relax. I was tired but happy with the meal. I will leave you with some reflections. I grew up with my mother making roast dinners regularly. 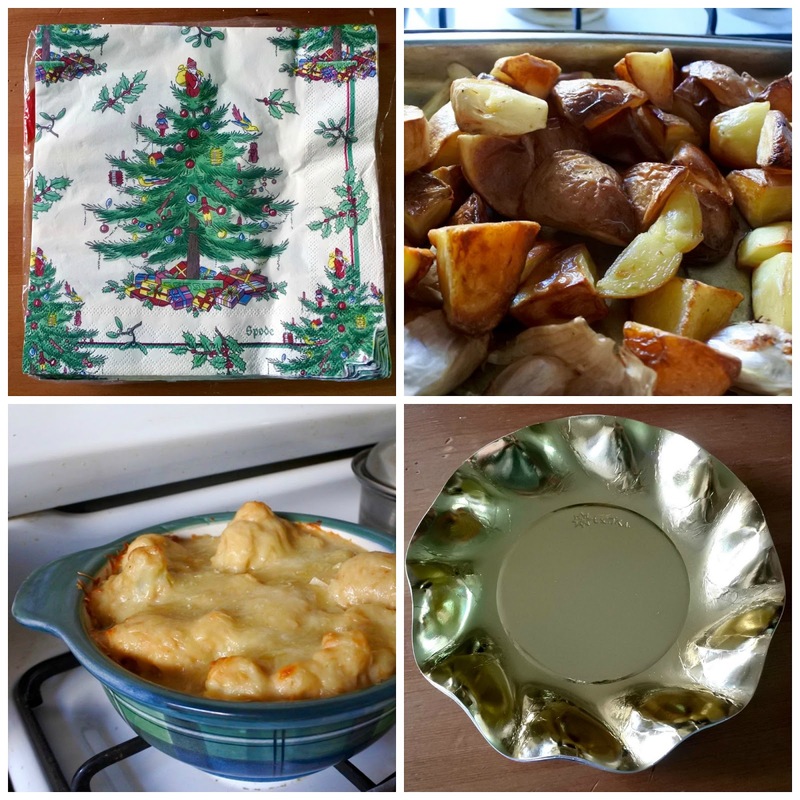 When I started cooking when I left home, the idea of making a roast dinner was really intimidating and I thought it odd my mum would say how easy they are. I think I have got to a point in my life where I find them a bit of work but they are also fairly simple because they are so familiar. The apples doesn't fall far from the tree! It seems I decide to do larger dinners and am all gung ho about them. Then I get all nervous about what to serve and it takes a while to get my head around the menu and shopping list. In the middle of lots of baking, I wonder what on earth possessed me to think I could do it. On the Friday I told E to remind me never to make reindeer cake pops again! But once it is done it doesn't seem so hard after all. And I take that little bit of confidence into the next dinner! 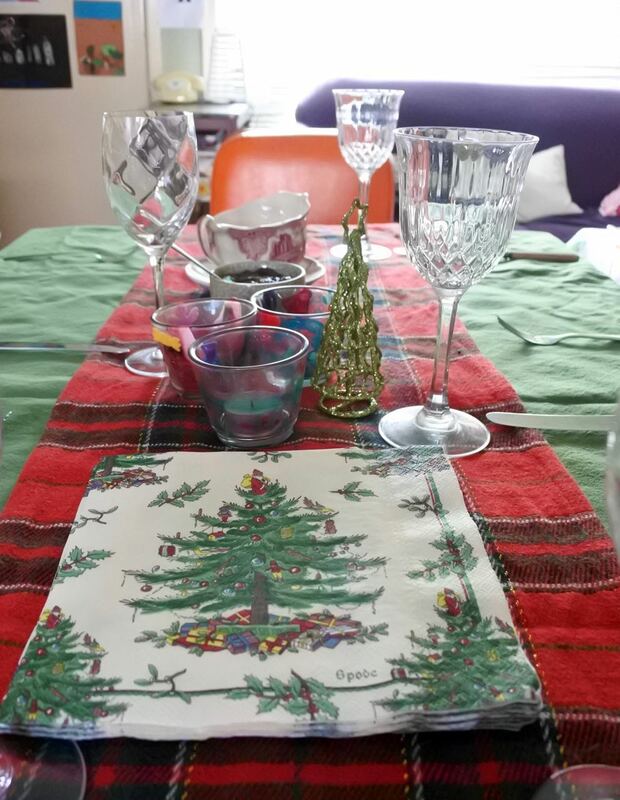 I will look forward to our next Christmas in July dinner. 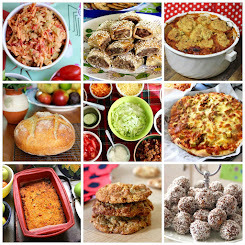 I am sending this post to Utterly Scrummy Food for Families where Elizabeth's No Waste Food Challenge is being held this month. Preheat oven to 190 C. Grease and line a 20cm square tin or a slice tin. Gently heat fruit mince, butter, sugar and golden syrup until butter has melted. (This can be done in the microwave in a large bowl which is what I did or on the stovetop in a large saucpan.) 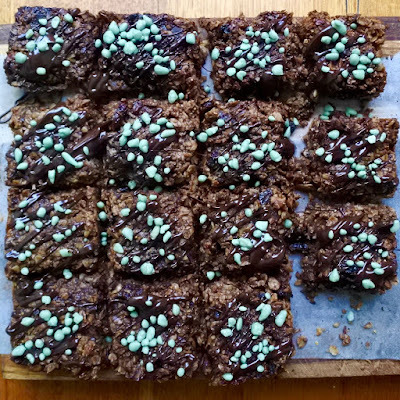 Stir in oats then chocolate. Scrape into prepared tin and smooth down with the back of a spoon. Bake for 20 minutes. Mark squares or bars while in the tin and then cool. Remove from tin and cut along the lines you have marked. If desired drizzle with chocolate and scatter with sprinkles. Keeps for 5-7 days in an airtight container. 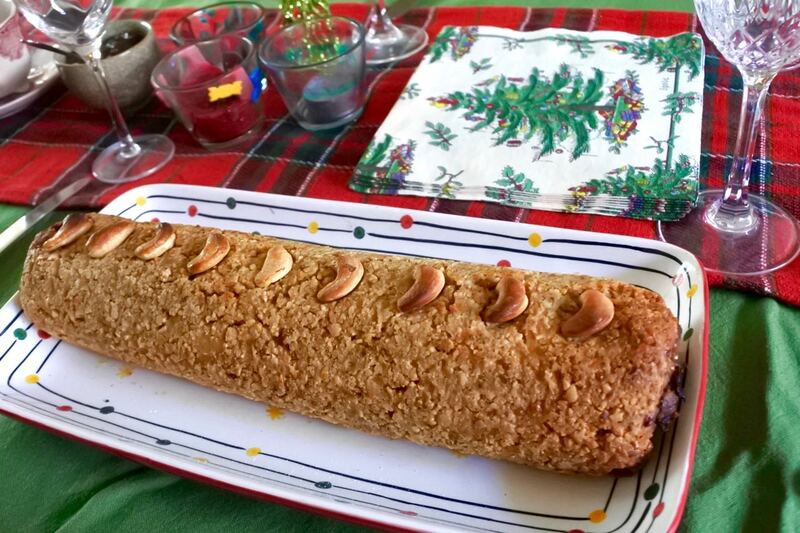 NOTES: To make this vegan check the fruit mince, margarine and chocolate are vegan. 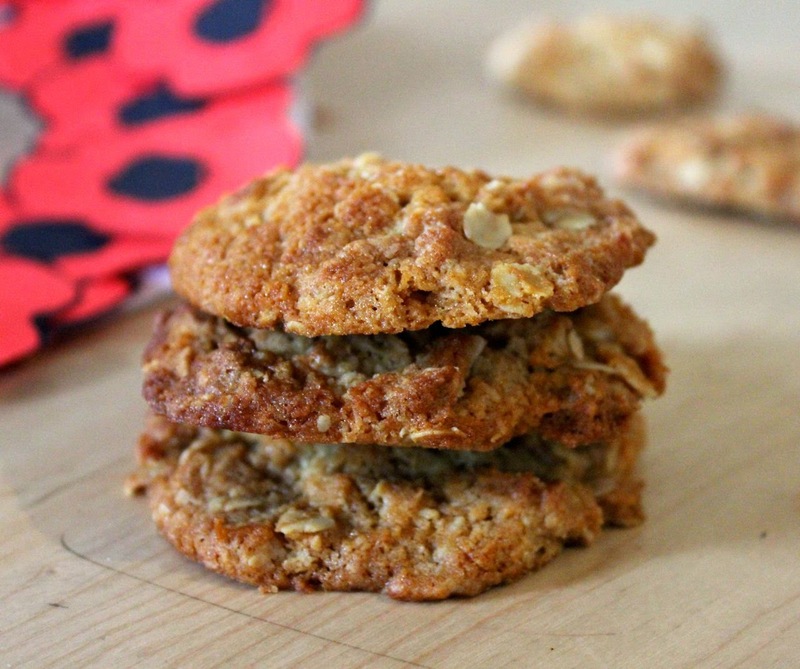 I had rolled oats and blended these up to be smaller because every time I make flapjacks with rolled oats they fall apart. I added the chocolate to the warm mixture and it melted so I would add the oats first and let it cool a bit before adding choc chips if you don't want them melting. 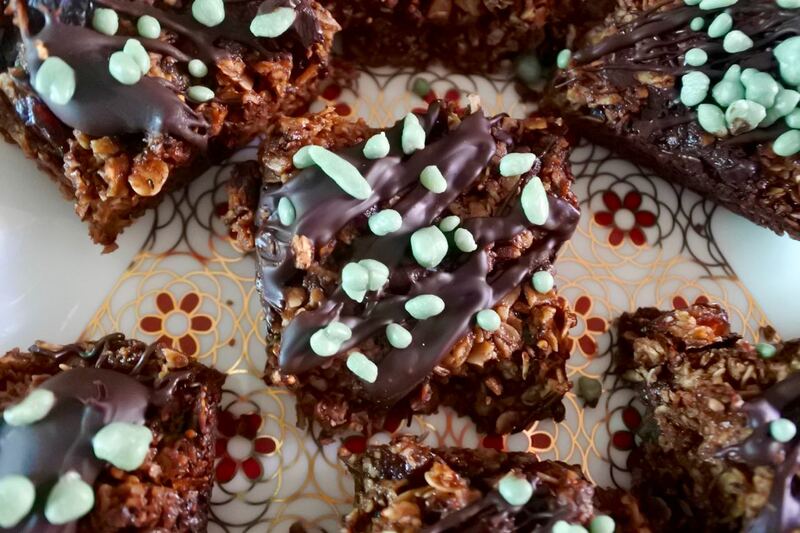 This recipe is open to lots of variations: you could substitute glace ginger or dried fruit for the choc chips, coconut oil for the butter, and other sweeteners. 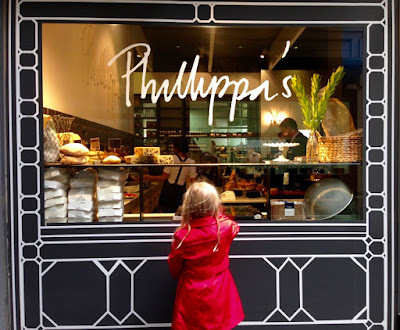 During the school holidays, Sylvia and I took a trip to the city to meet E for lunch. It started well with a fun visit to Cake Deco where we bought eyes for the reindeer cake pops and then wished we could buy everything else in the shop too. Then we met E at Shandong Mama and found they aren't doing their amazing crunchy scallion pancakes any more. I could have cried. 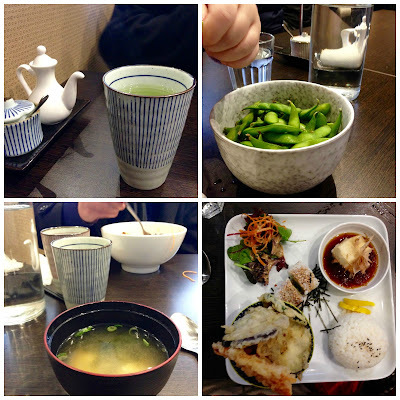 Instead we went for a walk and found some interesting Japanese food at Gaijin Bistro. E and I had some green tea while Sylvia had water. Then we started by sharing a bowl of edamame. They were warm and lightly salted. What bemused me was that there was nowhere to put the empty pods. Actually Sylvia thought they were hers. I thought I had edamame with a bento box so I didn't have many. My bento box didn't have edamame despite it being listed on the menu. I always thing bento boxes are boxes with compartments so I was surprised that my bento box was actually a tasting plate style tray. 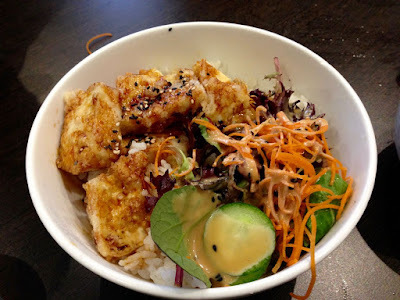 It had lightly battered agedashi tofu, vegetable rolls (which were like sushi rolls with seeds rather than nori around them but some thin strips of nori underneath), green salad with a tasty tahini dressing, pickled daikon radish, steamed rice and miso soup plus my choice of a main dish. Not bad for $12. I could choose from teriyaki tofu, tempura vegetable and curried vegetables. I fancied a Japanese curry. 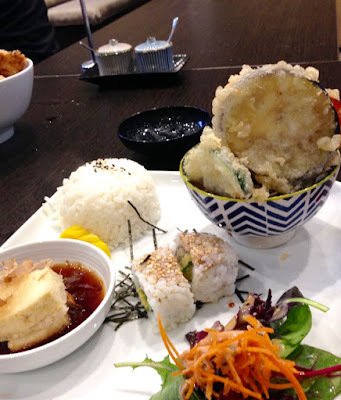 It came topped with some huge tempura vegetables that made me feel like I was given two main dishes. No complaining there. The tempura batter was light and crisp and the curry was tasty and warming. I was curious about the batter and asked the chef at the end of the meal. My guess was egg white but I was wrong. It was potato starch. I was relieved it wasn't egg white! And when I checked I was told that the teriyaki tofu was vegan. Best of all was this little money box when we paid our meal. 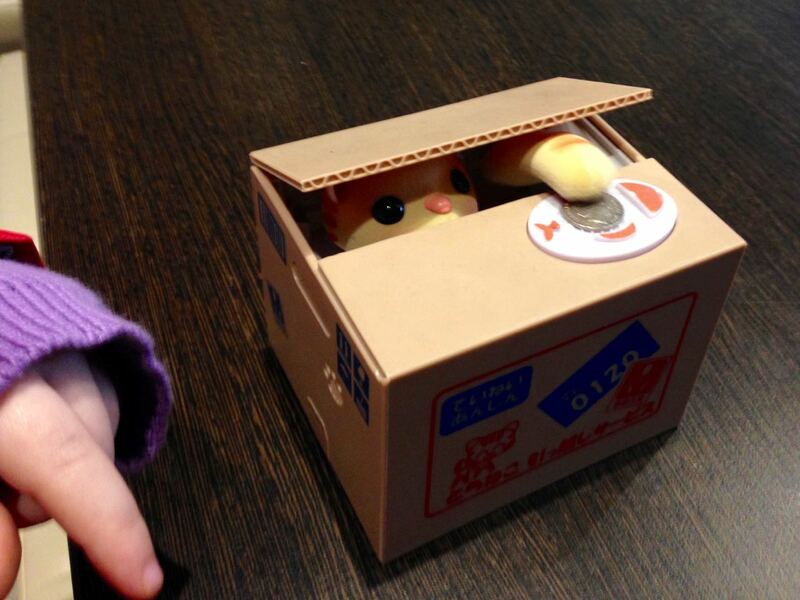 When we put a coin on the plate of fish the box opened and a little cat appeared poking out and swiping the money with its paw. The bistro is a small clean restaurant that apparently has a bigger cousin in South Yarra. I was disappointed that they have a long list of sushi but only one vegetarian one. However I was pleased with our vegetarian food and happy to find somewhere we can eat in the east end of the city. 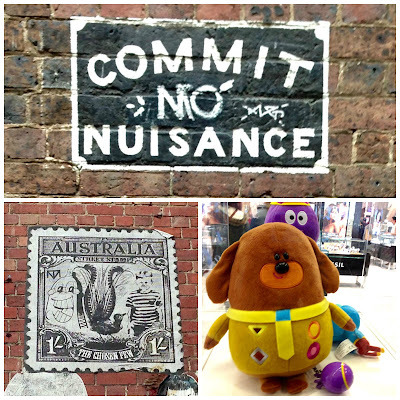 After farewelling E, Sylvia and I spent time wandering around Melbourne's streets and shops. Sylvia was quite taken with sampling perfume in Myer and wanted a Hey Duggie toy. We both loved the books in Dymocks and also chose some new crockery for our overflowing kitchen. 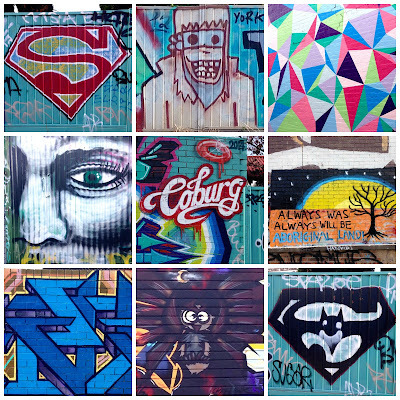 I enjoyed checking out the street art (though I was tempted by a cucumber variation on my favourite Elizabeth Arden Green Tea perfume). I had promised Sylvia a biscuit after lunch. 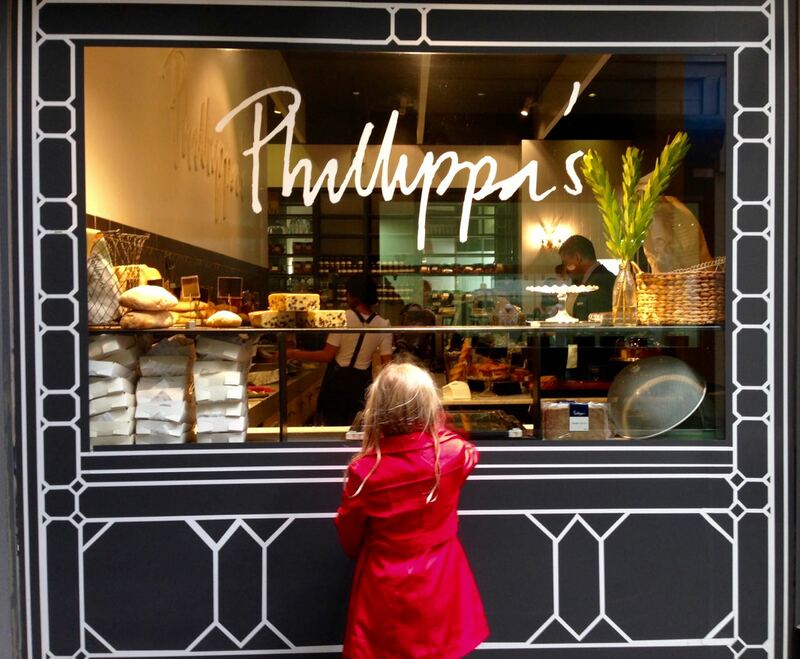 We stopped at Phillippa's city store. If I ever go past, it is hard to resist the temptation of browsing all her gorgeous biscuits and condiments. Her good are pricey but worth paying top dollar for quality. One of these days I will stop and try one of her sandwiches. 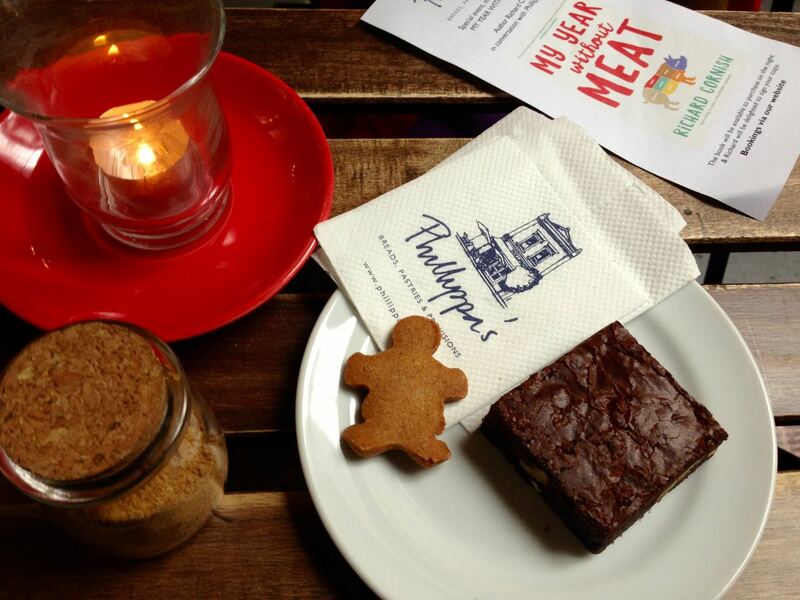 Last week I had a brownie and Sylvia got 3 pipsqueak gingerbreads. The brownie was superb. Sylvia was not keen on the walnuts in it but I thought it was exactly the dense chocolatey indulgence that all brownies should be. We sat outside in the little arcade where there are no outdoor heaters but blankets have been thoughtfully placed on the chairs. On the way to the train station we sauntered through DeGraves St. I was impressed with the interesting array of doughnuts at Doughnut Time and made a note to return there one day when I have more room for sweet food. 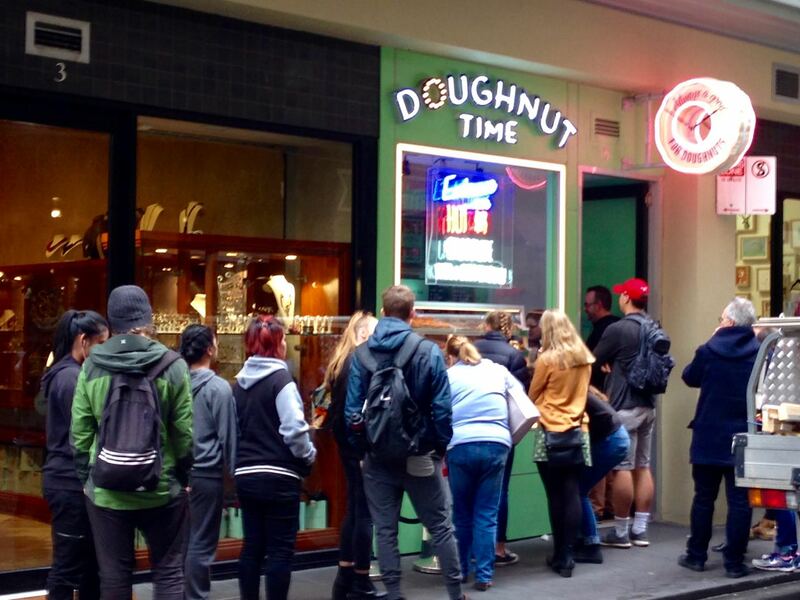 I hope the queues aren't this long every day. We also admired cupcakes at Little Cupcakes and tasted chocolates at Chocamama. Then it was time to head down into the subway and look at the artwork in the exhibition windows. 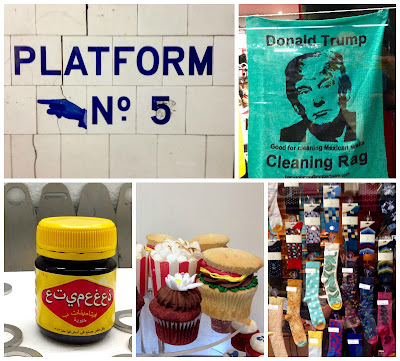 We were fascinated by the arabic vegemite exhibition with the arabic label, the wine glass smeared with vegemite and the arabic word written in vegemite. 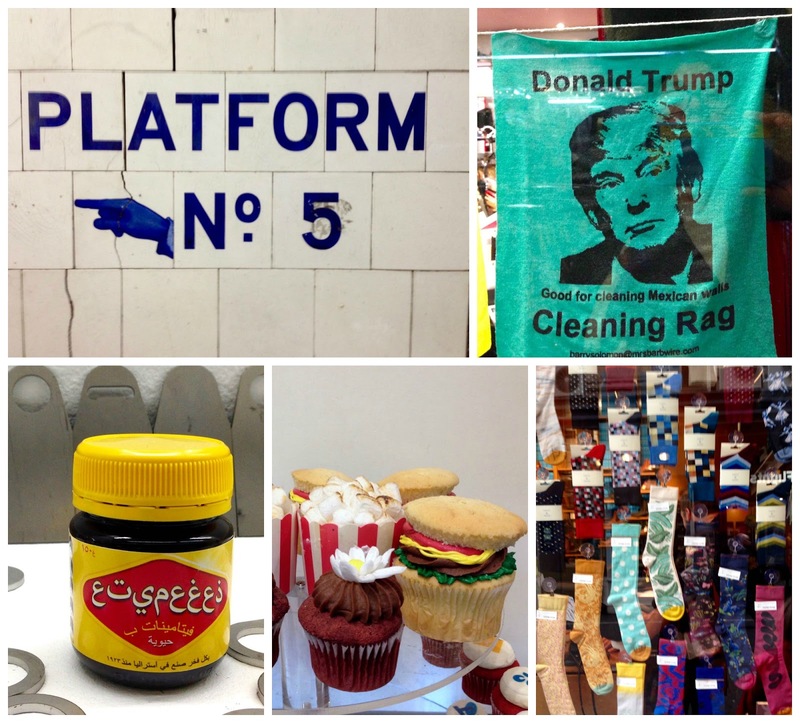 And of course the Donald Trump cleaning rag amused me. Then we found our train homeward bound past the flooded creek. 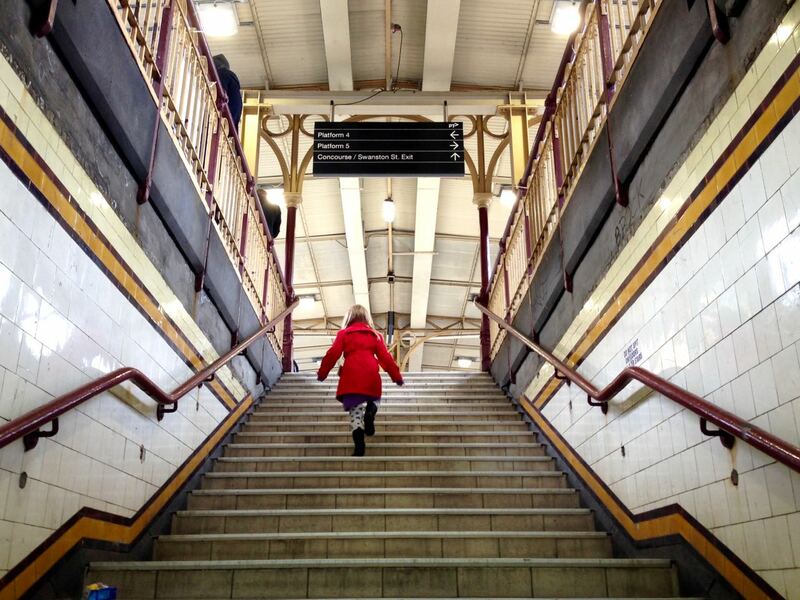 When we got out at our station, we were glad Sylvia had brought her teddy his raincoat because it was really cold. We hurried home to huddle in front of the heater. You might do a double take at a Rudoplph the Red Nosed Reindeer in the middle of the year but I love celebrating Christmas in July. We had some friends over for a wintery festive dinner this weekend. I will write more about the dinner when I have a bit more time. Today I will just tell you about the fun reindeer cake pops we made for the dessert. 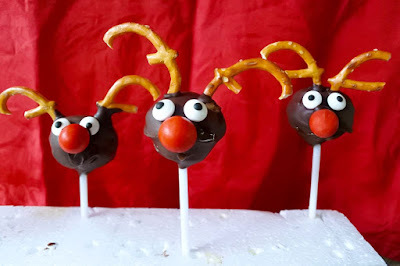 While thinking about Christmas food, I came across a reindeer cake pop on Caroline Makes. It looked simple enough. However I decided I am rubbish at eyes and it would be even easier if I bought edible eyes at Cake Deco in the city. I thought the reindeer had a jaffa nose but it the supermarket wasn't selling packets of jaffas (red-covered orange-flavoured chocolate balls). I had to buy them at nut shop. Then I read Caroline's post again and found she used MandMs. When I made the Aboriginal flag cake on Monday with Sylvia and her friend, I doubled the recipe and kept half aside for cake pops, including the buttercream frosting on top (but discarding the liquorice decorations). I added a little yoghurt to make sure it clumped together. The cake was really sweet and I would probably use a less sweet cake (or reduce the sweetness in this one) next time. Sylvia also has a favourite Women's Weekly Cute Cake Pops book she browse regularly and makes recommendations as to what I should make. 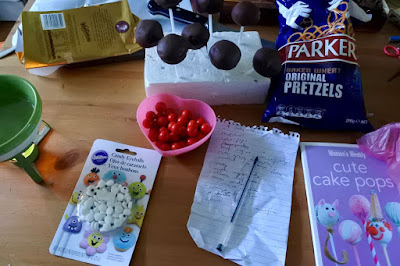 It was useful in looking for advice in making the cake pops. One tip was to use chocolate melts or chips rather than eating chocolate because it melts and set better. So I used choc chips which worked well, though they are far sweeter than the dark chocolate we regularly eat. Last time I made cake pops I remember talking to my mum about the melted chocolate being too thick. She suggested putting the bowl over a saucepan of simmering water. I took her advice - sort of! I put the chocolate over a little bowl of boiling water with a candle underneath. I think it is an old chocolate dipping set. It worked a treat in keeping the chocolate melted and not too thick. 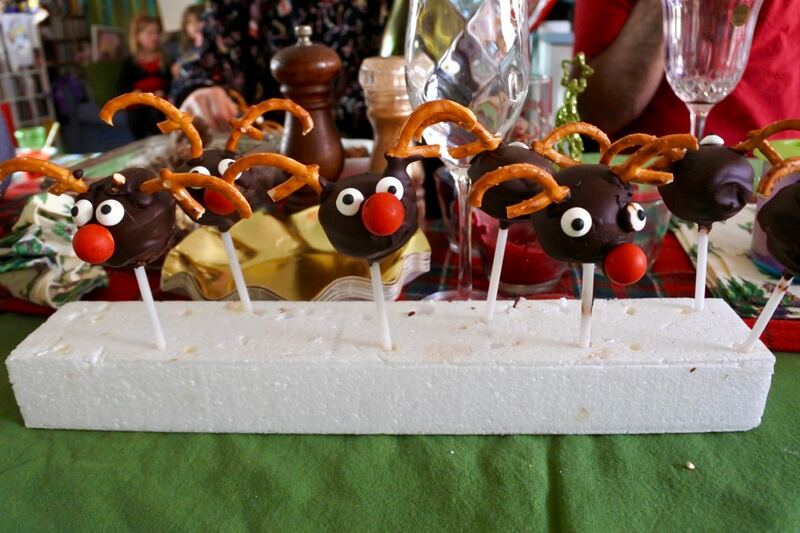 Once the cake pops were dipped, the next challenge was to prepare and add the antlers, eyes and noses. Thank goodness I bought the eyes. Chopping the pretzels in the shape of antlers was challenging. So many cracked the wrong way that I think my reject pile was bigger than my antler pile. 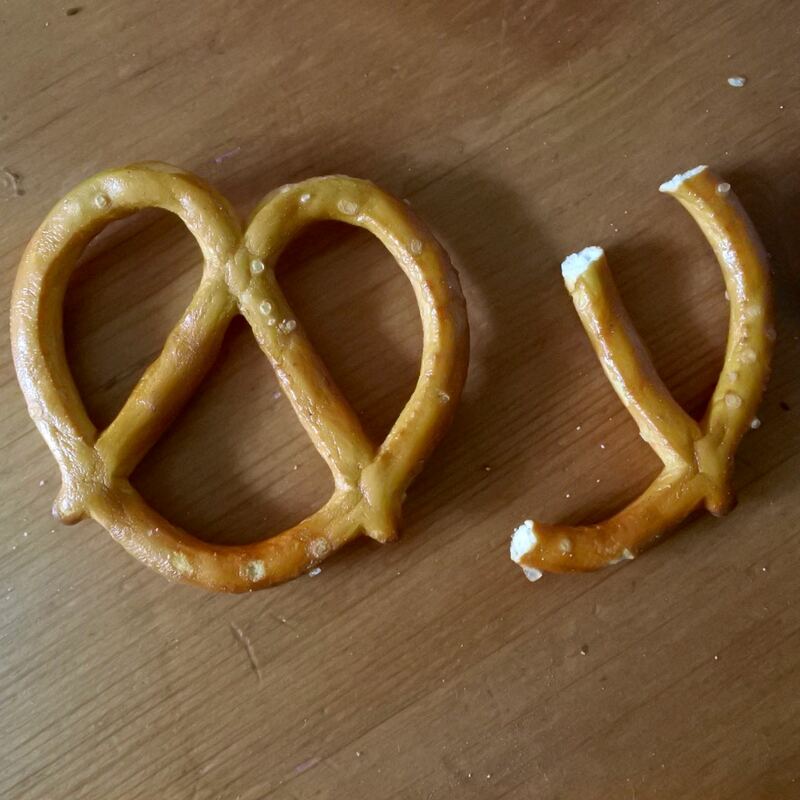 Below is a picture of a whole pretzel and one of a sliced one showing which part of the pretzel I sliced.) Afterwards I checked out more online reindeer cake pops and wondered if I should have experimented with chopping different part of the pretzel. Hindsight is a wonderful thing! I also decided it would be easier to stick the jaffas on if I sliced off an edge so they had a flat edge to stick to the cake pop. Again many jaffas shattered so I had lots of rejects here too! I put together and dipped the cake pops while Sylvia was at a friend's place. I had promised I would leave some for her to decorate. In fact, the three below were the only ones I had the energy to decorate before she got home. She was delighted. As my first foray into decorating cake pops, I was pleased with our effort and am sure I will be persuaded by Sylvia to do it again! Meanwhile I will be back soon with more on our Christmas in July dinner. Crumble the cake into a large bowl and massage into a clump with your hands using some frosting or cream cheese or yoghurt, as required to bind it. I found that as my cake was frosted and quite moist it needed very little extra moisture. Roll into balls about the size of a walnut. 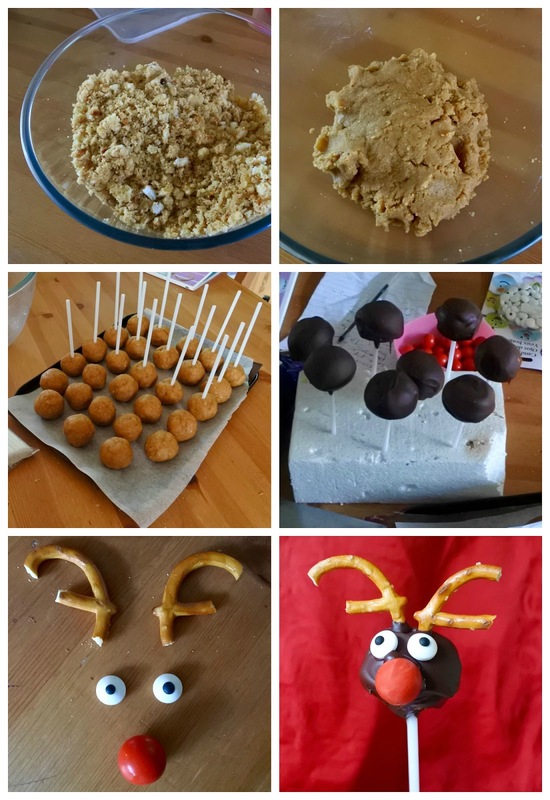 Place on a baking paper lined baking tray or other tray and stick cake pop sticks or icy pole sticks into the balls. (I do this when freezing the balls and when I cover with chocolate I make sure some of the chocolate is on the stick but I see others say to freeze balls and then dip stick in chocolate and stick into balls.) Chill in freezer for about an hour or in fridge for a few hours. Melt about half the chocolate and set bowl over a bowl of boiling water to keep chocolate melted. Prepare some polystyrene blocks to stand cake pops in. (Or use cardboard boxes with holes in them.) 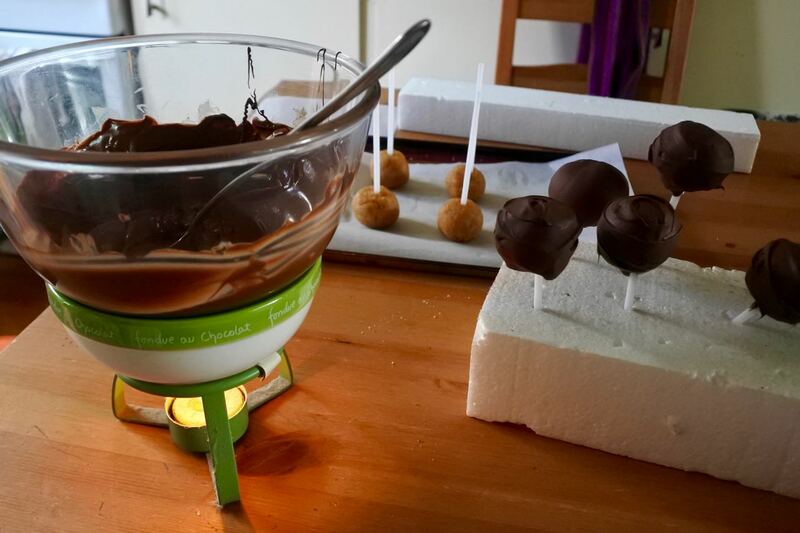 Take a few cake pops from the freezer at a time and dip in chocolate, using a spoon to cover them if needed. Let as much chocolate as possible drip from them and then stand to set in polystyrene foam. They will set quickly and can be returned to the fridge until ready to decorate. 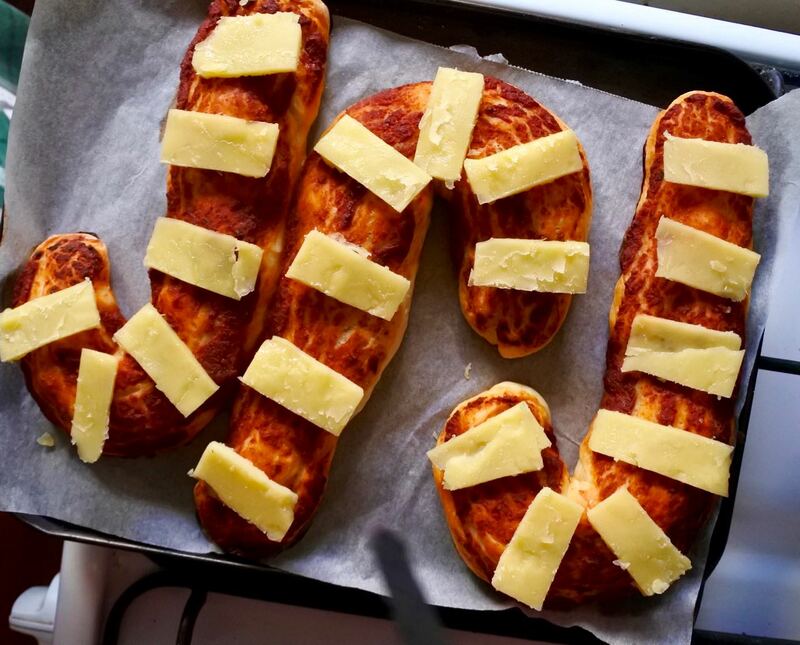 Before decorating cut antlers out of pretzels as depicted in photo in post and slice edged off jaffas. To decorate first put in the antlers. I had a metal skewer that I heated on the candle under the chocolate and then made a hole in the cake pop with it, cleaned the skewer and repeated to make a second hold. 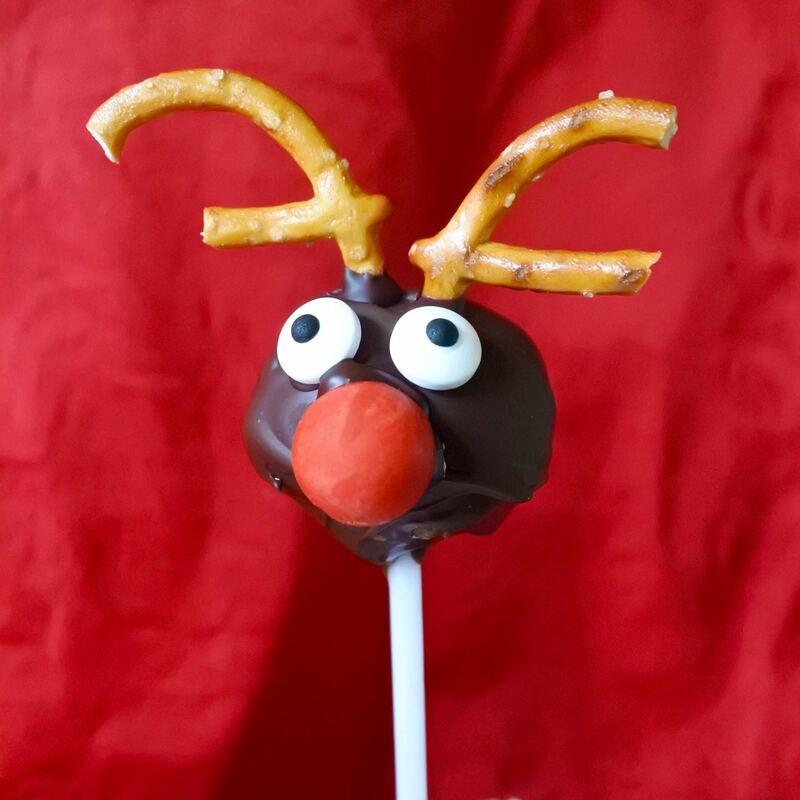 Dip the ends of two "pretzel antlers in chocolate and push into holes. Put a small amount of melted chocolate on the eyes and nose (just enough to make it stick but not so much that eyes/nose will slide off and take ages to dry) and place on cake pop. If they don't stick after holding it there a few seconds, you are using too much melted chocolate. While putting on antlers, eyes and nose, try to hold by stick rather than touching the chocolate (which will leave finger prints).